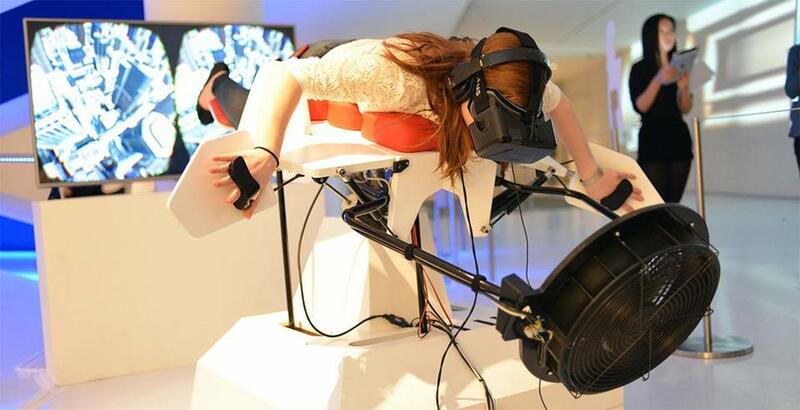 A user tries out Birdly, a virtual reality device that lets people experience what it&apos;s like to be a bird soaring through New York City. Have you ever dreamed of flying? Now that dream can become reality. Well, virtual reality. The directors of Le Laboratoire Cambridge in Kendall Square are hosting a new exhibit next month called Birdly, a flight simulator that uses arm holsters and 3D goggles to give a person the feeling of a bird soaring above ground. Created by Swiss artist and software developer Max Rheiner at the Zurich University of the Arts, Birdly will be on display at Le Laboratoire, a gallery space that promotes projects combining the arts and sciences, from Dec. 2-5. After putting on a pair of Oculus Rift 3D goggles, users lie on their stomachs and slip their hands into straps, with their arms outstretched. A fan that’s set up at the front of Birdly blows air into the user’s face to simulate the feeling of sailing across the sky. Sound from the headphones adds to the multi-sensory experience. A person’s speed in the virtual reality realm — a New York City setting — increases and decreases based on how hard they flap their “wings.” They can also change direction, cutting through city skyscrapers, based on how they shift their body. “They can dive, they can move around the buildings — it’s really the experience of being a bird from a first-person perspective,” said Fitzsimmons, who said some people have experienced vertigo and the stomach-dropping feeling mid-flight. The virtual reality experience made its way to Cambridge through a partnership with swissnex Boston, the Swiss consulate, after first making stops in New York City, San Francisco, and at this year’s Sundance Film Festival. The exhibition is free to the public, but visitors must come to the gallery in person to schedule same-day appointments, according to the curators at Le Laboratoire.